It seems like these days, I either buy something like a Figuarts Kamen Rider or something basic like a Mystery Mini. While I like the quality and representations of the SH Figurarts line, Mystery Mini’s are fulfilling my toy hunting desires. This one is no exception. I was standing in line at Wal-Mart and saw a box of DC Heroes Mystery Minis. Now, I had passed on some of the Batman V. Superman ones because the alter ego versions seemed a little plain. But looking on the assortment on the side of the box, there was a one in twelve chance for most of the figures and really no duds. Well, the chase White Lantern Batman maybe. And Aquaman. I’m kidding. If I’d have got Aquaman, I would have sent him to Scott from the podcast. 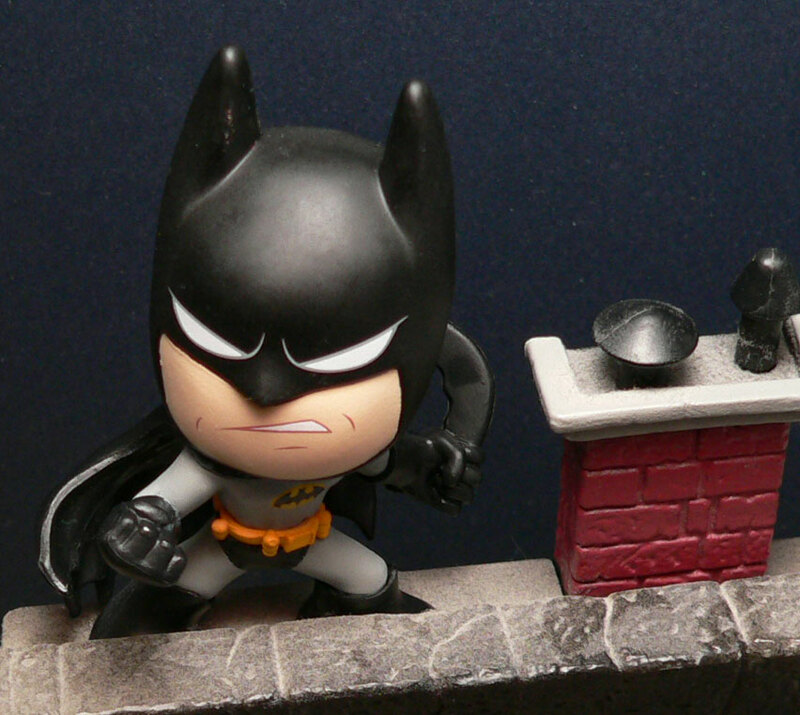 Anyway, I was surprised when I opened the little box that Batman was inside. This is the standard Bats with black and grey. There is a rarer blue and grey version, as well as the aforementioned White Lantern version. Honestly, this would be the one I would pick anyway. The first thing that struck me is that he’s in a bit more of an action stance than most of the Mystery Minis. 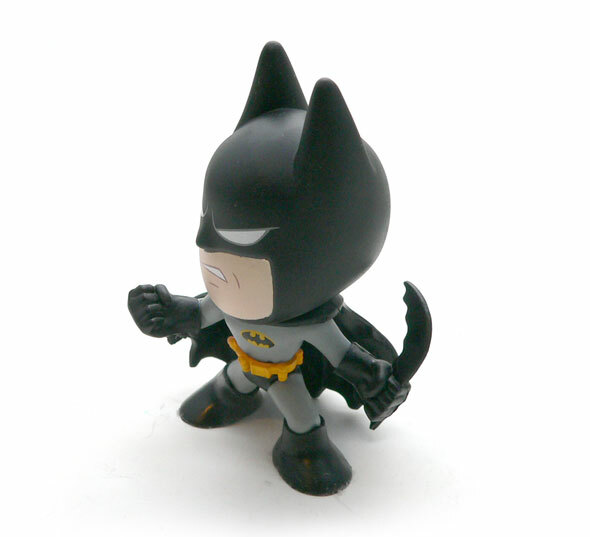 He has his cape furled behind him, a batarang in his left hand, and is making a fist with his right. This lil dude means business. I love the head on this guy. His face just is a perfect expression for Batman. the eyes are slightly squinted and have a bit of an extra line in the corner to sell it. The mouth is a half snarl that shows he’s a bit ticked off. All of it is well done without a trace of slop. 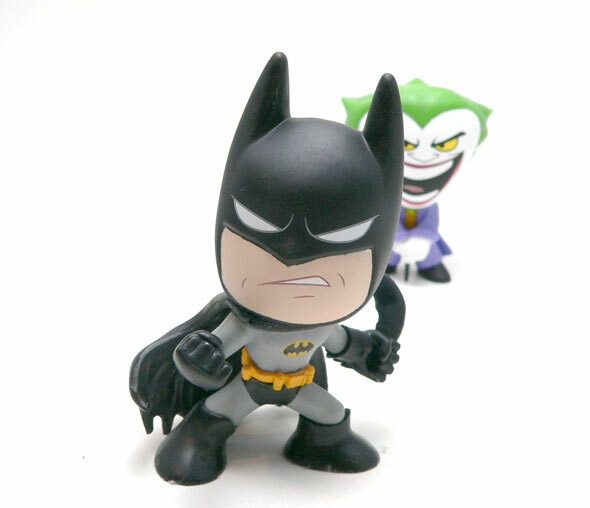 Now Bats here seems to follow the recipe some of the other Mystery Minis do by having separate molded colors in stead of paint. Because of this there is no paint errors. The only paint, other than the head, is the requisite bat logo. I’m surprised they went with the yellow oval since most versions have just a black bat now. I’m not complaining, I like the oval. Every detail you expect for Batman is here. Batprongs on the gloves? Check Utility Belt with pouches? Check Scallops on the end of the cape? Check. It’s all there. It really is a mini cuted up version of the Dark Knight. I do really like the dynamic sculpt on the cape. So many times with action figures, the cape is either too much or not enough. Here it is perfect and really adds to the dynamic nature of the figure. 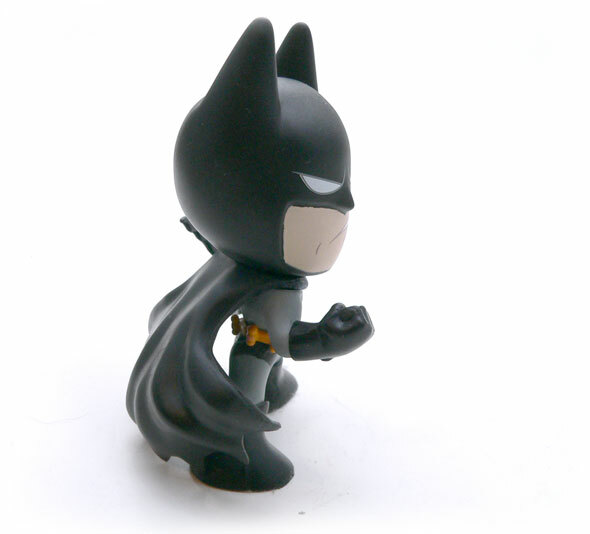 I have to say overall, this little guy reminds me a bit of the animated series Batman. Colors, pose, expression, I’m not sure why. Now while I was expecting somebody like Martian Manhunter, I’m very happy to have got Batman. The best part? There’s no Bane in this line and now my Joker has a foe to face off against.